Wang's trip to India is of great significance: China? Beijing: China today said Foreign Minister Wang Yi's just concluded visit to India is of "great significance" and sent out a message that Chinese leaders pay high attention to bilateral ties and their mutual interests far outweigh disputes. "From this visit, we know that Sino-India relation is now in a new age of gearing up," Chinese Foreign Ministry spokesperson Hua Chunying told a media briefing here. 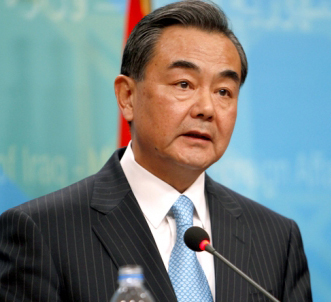 New Delhi, May 29 : Chinese Foreign Minister Wang Yi is arriving in India June 8 as special envoy to President Xi Jinping, official sources said Thursday. Wang's visit comes days after SAARC leaders attended the swearing-in ceremony of Prime Minister Narendra Modi May 26. Beijing, Nov 7 : Chinese Foreign Minister Wang Yi will attend the 12th meeting of the foreign ministers of China, Russia and India and also the 11th Asia-Europe meet in India Nov 10-11, the ministry announced Thursday. Wang was invited by India's External Affairs Minister Salman Khurshid, Xinhua quoted foreign ministry spokesman Hong Lei as saying. About the China-Russia-India foreign minister's meeting, Hong said the ministers would have an in-depth exchange of views on the current international and regional situation and issues of common concern.